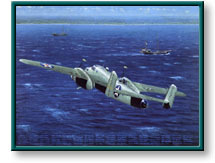 This print is a dramatic and completely authentic portrayal of Lt. Col. James H. Doolittle's B-25 approaching the coast of Japan. Signed in the plate by the Doolittle Raiders, and pencil signed in the border by the senior surviving crew member from each plane, including General Doolittle. After detailed interviews and in-depth research, aviation artist Bill Phillips has re-created the sea, coastline and weather conditions just as they existed on April 18, 1942. Likewise, General Doolittle's aircraft, No. 40-2344, is completely authentic. The print is packaged in a custom-designed Tokyo Raiders portfolio bearing the group's official coat of arms. Image Size: 23.5" x 29.5"
This extremely rare print (#1148/1250), which was released in 1983, is hand-signed by 16 pilots including General Doolittle and comes with its original folio and certificate of authenticity. It is deluxely framed and the colors are still rich and vibrant like they were over 34 years ago! The Giant Begins to Stir copyright© 1983 by William S. Phillips is prohibited from being copied. All applicable copyright© laws apply and are reserved by artist William S. Phillips.